My friend and I go to Joann’s quite a bit; we both like to do crafty things to keep us busy for those rare moments when our children aren’t enough. 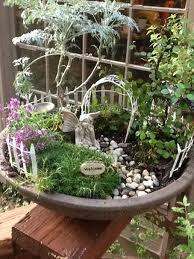 Anyway, she mentioned that she wanted to make a fairy garden one day. Both of us are very into fantasy. We read the same books, know some of the same movies. It’s awesome. But it made me think about what I want my children to grow up with. I want my son and any future children to grow up with a strong belief in the unseen. I want to know have a vivid imagination and to believe in what they cannot see. And not just Santa Claus and the Easter Bunny, but elves, goblins, gremlins and fairies. At the moment, my son doesn’t watch many shows that have these fantastic things in them; he prefers Thomas and Friends and Jake and the Neverland Pirates, but of which have elements of fantasy in them. But I will get my moment and be able to cultivate a belief and a love of magic. He can help me make a fairy garden or have a guardian dragon to watch over him. I have an Amy Brown print that will go up once we don’t live in an apartment anymore. He will have a rich and vivid and active imagination.